Was Saint Elizabeth Ann Seton a Mystic? We haven’t spoken in this account of St. Elizabeth Ann Seton about any visions, locutions or mysticism. Quite honestly, that’s because we haven’t come across anything of that nature. And Mother Seton had always been a very down-to-earth, practical woman. However, the time was to come when the Lord would decide when the community would be built, where it would be built, and how it would be financed. And that information had to be projected to Mother Seton. This question had been rolling around for some time in Elizabeth’s mind. She even wrote to Antonio Filicchi in Italy, in an attempt borrow money for the building of the convent, but although her letter reached him, his reply never reached her. She took this as rejection at first, until a year later when his letter arrived, long after the fact. But it is obvious that she was throwing out feelers. Whoever the Lord wanted to be involved, would respond in a positive way. That was Elizabeth’s thinking. However, the Lord unfolded another plan, His plan. One day, Elizabeth ran into the office of Fr. Dubourg to tell him what the Lord had clearly said to her during Communion at Mass that day. “Go and address yourself to Mr. Cooper; he will give you what is necessary to commence the establishment.” Now, this could be considered by some as being out of left field. Mr. Samuel Cooper was a well-to-do young man from Philadelphia who had converted to Catholicism, and was discerning if the priesthood was where the Lord wanted him. He met Elizabeth when Fr. Hurley brought him to Baltimore for the consecration of St. Mary’s Chapel. They had become close friends for a while, because they had so much in common. They went their separate ways in their search for God’s Will in their lives, but remained friends and were in communication with each other from time to time. They had not seen each other for a while, and so the suggestion had to come from the Lord; it didn’t come from Elizabeth. evening, asking what was happening with the convent for the ladies who wanted to embrace the religious life. Without mentioning anything about Elizabeth Seton to Mr. Cooper, he shared that there were many who wanted to proceed with this project, but they couldn’t for lack of money. Mr. Cooper said to him quite calmly, “I have ten thousand dollars which I can give you for this purpose.” Bingo! At the mention of Emmitsburg, the priest was taken aback. He did not really approve of the idea of being out of Baltimore. Neither did Elizabeth Seton; neither did the archbishop. Of all the people involved, only Mr. Cooper saw the vision of Emmitsburg, and while he vowed he would not exert any influence in choosing the location, Emmitsburg was the final choice. Each time Bob and I finished a chapter, we felt sadness at having to leave that special woman. Then, when we’d begin writing of the next powerful woman in the Church our excitement would build again. We developed such a unique relationship with these women; we didn’t want to let go of any of them. We pray they have touched you the way they have touched us. Now it’s over, at least Volume I is finished. We know we will bring you Volume II, because there are so many women in our Church we can be proud of, whom we can embrace and after whom we can model our lives. We told you about the thread that connected these women together. It was and is the Eucharist, the strength Jesus gave them and gives us in times of struggle, adversity, and downright despair, His very Body and Blood. It’s a Power Source we must plug into. We can spin our wheels and go round in circles, trying to do the impossible, only to find that Jesus allows us to do these things with such ease, by energizing ourselves with the Eucharist. In researching these sisters, as well as the many powerful men in the Church, we found without exception, a deep and committed devotion to Our Lady, Mother Mary. We have not found anyone who truly loves Jesus, that does not revere His Mother as well. They took the most direct route, to Jesus through Mary, having found that they could not really know the Son without knowing the Mother. One is pride in those who came before us; the other is hope in those who will follow. Two strong feelings have come out of this book for us. One is pride in those who came before us; the other is hope in those who will follow. We feel strength from those women of the Church who have fought against the powers of hell, and triumphed. Because of them, we have hope for our Church and world of tomorrow. We know the Lord will always raise up women like those in this book. Who are the Powerful Women in the Church of tomorrow? Right now, we know the Lord has placed you out there, in strategic positions, to glorify Him by your lives. There are Teresas, Thereses, Bernadettes, Ritas, Catherines, Clares, Mother Angelicas, Briege McKennas,, and so many more the Lord would use in His Service. You know who you are, Powerful Women of the future. You can feel it. When you read about one of your sisters, living or dead, a surge of pride went through you. There was a familiarity, a kinship you felt, that could not be denied. Your heart started beating a little faster as you related with their joys and struggles, their closeness to Jesus and Mary. Our Church has always been under attack. We may possibly be in the last days. Every moment counts. Your sisters before you have known of the urgency of the moment. They lived their lives as if the second coming of Jesus was just around the corner. And it may very well be! Those who are true lovers of Christ are not worried about their own individual salvation. That’s been assured. “Those whom God has chosen, He has justified; and those He has justified, He has glorified.” (Romans 8:28) Theirs and our concern is for the brothers and sisters who may be left behind. How will we turn the tide? You must touch them, powerful woman in the Church! In our talks, we tell people to forget the numbers, but to put faces on those who have left. We’re told that there are six billion people on earth. Two billion are Christian of some kind. That means that 2/3 of the world do not know Jesus. How can we reverse those figures? You must teach them, powerful woman in the Church! 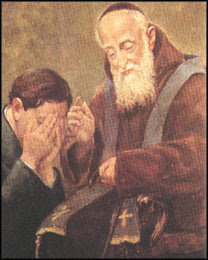 Whether you make your mark by praying in the cloister of the Convent, as did Therese, the Clares, and Bernadette; or reform the Church as did Catherine and Teresa; or go door-to-door; or minister to Priests and Bishops and Third World countries, as does Sister Briege; or proclaim the glory of God through space by means of television, radio and internet like Mother Angelica; or be faithful to your vocation as obedient daughter, wife, mother, and Religious, as did Rita; wherever the Lord calls. You know who you are! You know where you are! This is not the time to sit in a circle and argue among ourselves about who did what to whom, as the enemy of Christ picks off Christians from behind. We don’t have that luxury! We don’t know how much time we do have. We do know one thing. You can do it, powerful woman in the Church! Jesus loves you; Jesus needs you; Jesus wants you! When Leopold had dreamed of the priesthood, his eyes traveled over the Adriatic Sea to far-off lands to bring the Gospel of Hope to brothers and sisters starving and thirsting for this Lord Who died for them. He was not to even travel from village to village, like Father Francis and Saint Anthony (Saint of Padua), proclaiming the Good News. He was not even called to prepare others for this mission, by founding institutions or teaching in seminaries. Instead the Lord placed him in a tiny pulpit, a tiny room with no window to the outside world, with no air or light, freezing in the winter and sweltering in the summer. Unlike the thrones of kings, this future Saint sat hours upon hours ministering to God’s subjects in an old broken down chair that was as feeble as the body it held on its lap. A simple kneeler is still beside the rickety armchair, awaiting the contrite. Our Lord Crucified hanging on a wooden cross is above the prie-dieu, a reminder of that God Who loved us so, He asked His Father, with His last words, to forgive us our sins. And then in this small cell looking down lovingly, on priest and penitent, there is a picture of Our Lady, the Mother of God who interceded at Cana and continues to intercede for Her children on earth with Her Beloved Son Jesus. As our Mother we can still see Her there, ready to help all seeking forgiveness, to reconcile with God the Father and Jesus Her Son. In this tiny cell, for most of forty years, spending more than twelve hours of love per day, he waited and received thousands of penitents, streaming in without interruption, one after another to receive the Sacrament of Penance. Here there was no class distinction; the poor asked for forgiveness kneeling on the same prie-dieu as the rich; the famous turned to God for His Salvific Mercy, alongside the infamous; priests, bishops and religious confessed to Father Leopold (fifty priests the day before he died); professors lined up beside their students – all children of God seeking forgiveness. The hardest hearts of stone were converted into hearts for Christ alone. Conversions came about through this little friar who was not eloquent, his voice at times hardly audible. His compassion transformed even those most hardened by years of unrepentant sinning; they began the long road to changing their lives, as they became convinced, through this humble messenger, that God loved them even when they were sinning. Upon discovering this unconditional love of the Lord, a love they had never known, true healing came about; they received the fullness of the compassionate gift of Reconciliation, and then the Life-eternal Gift of Our Lord truly Present in the Sacrament of the Eucharist. Oh, if only our priests would remember how great is the gift they have received, the gift of administering the Sacraments to the faithful! If only we, the Mystical Body of Christ, knew the priceless treasures Jesus left us, those Seven Sacraments we receive through the consecrated hands of these Ambassadors of Christ, then we truly would be one as Jesus prayed to the Father. You are currently browsing the archives for the Super Saints category.